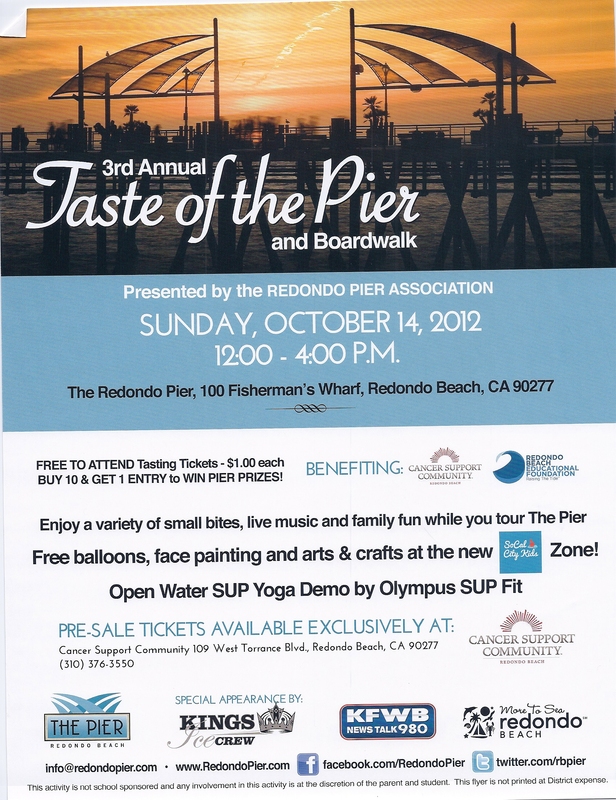 The Redondo Pier Association is hosting the 3rd annual Taste of the Pier & Boardwalk this Sunday, Oct 14, 2012. The event will start at 12 pm and end at 4 pm. It is free to attend. Buy 10 tickets and trade tickets for food or items at all of the participating retailors. This year, we will be offering our Spicy Fish Soup as well as our Hawaii Garlic Shrimp. Our outdoor restaurant now known as Portside Cafe will be offering Clam chowder as well as Lazy Cajun Shrimp Boil. Our Cajun Shrimp was a great success at the Lobster Festival this year. Stop by and try some! There will also be live music as well as fun for the whole family. The weather will be great resting in the upper 70’s. Continuing the group effort to revitalize the Redondo Pier, we hope to see all of our locals come out and enjoy the day with us. 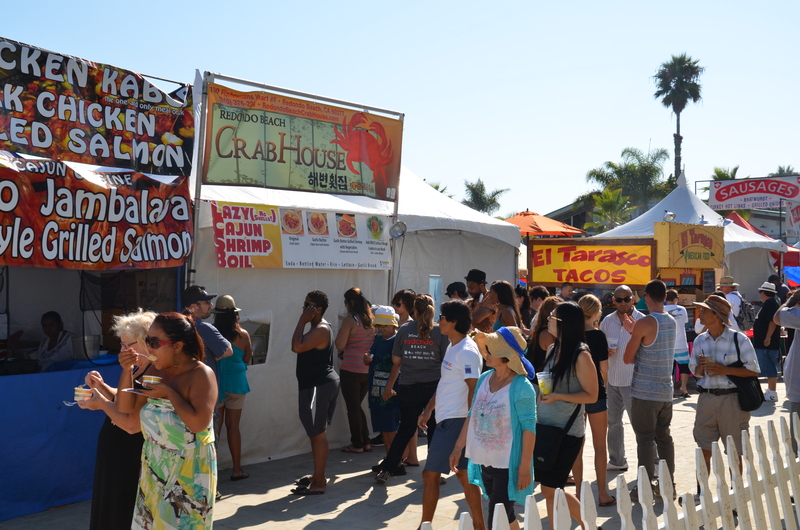 2012 Redondo Beach Lobster Festival! Thanks again to everyone who showed up and had a great time at this years Lobster Festival. 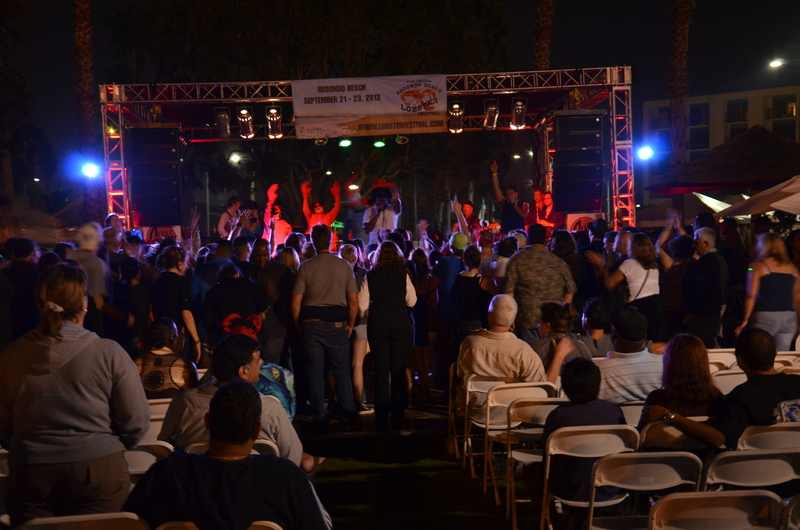 The festival was great and there was a huge turnout. As always, there was a great live band lineup and dancing as well. Our neighbors were one again big Al’s and it was great to see them again. This year we served our Cajun Shrimp Boil, Original Grilled Shrimp, and our RBCH Cajun Lettuce Wraps. It was a huge success. So much that we actually ran out of shrimp by mid Sunday afternoon. (Sorry, we’ll make sure to get much more next year!) For those who weren’t able to make it out this year, we hope to see you all next year! 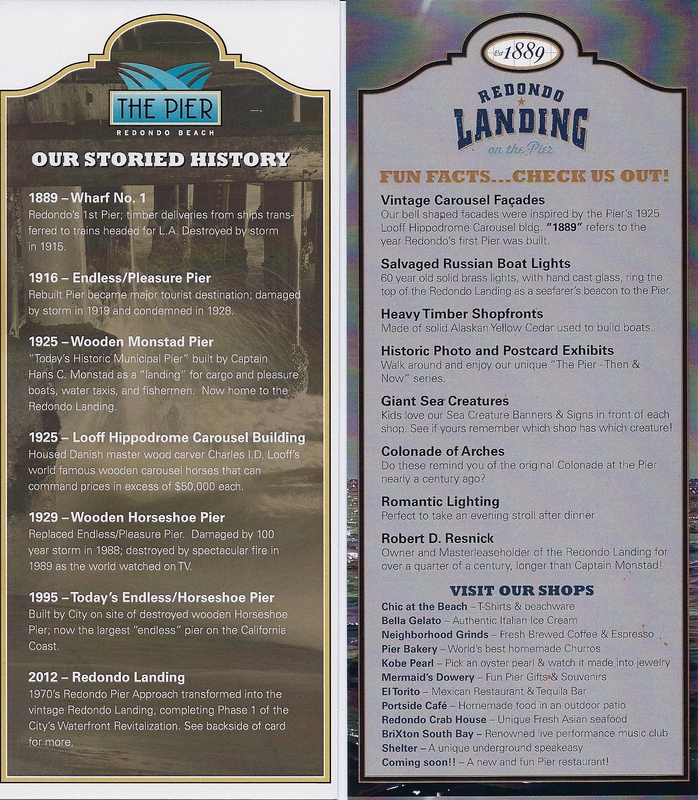 Here is some history on the Redondo Beach Pier as well as information & fun facts! Wow, we are finally here. 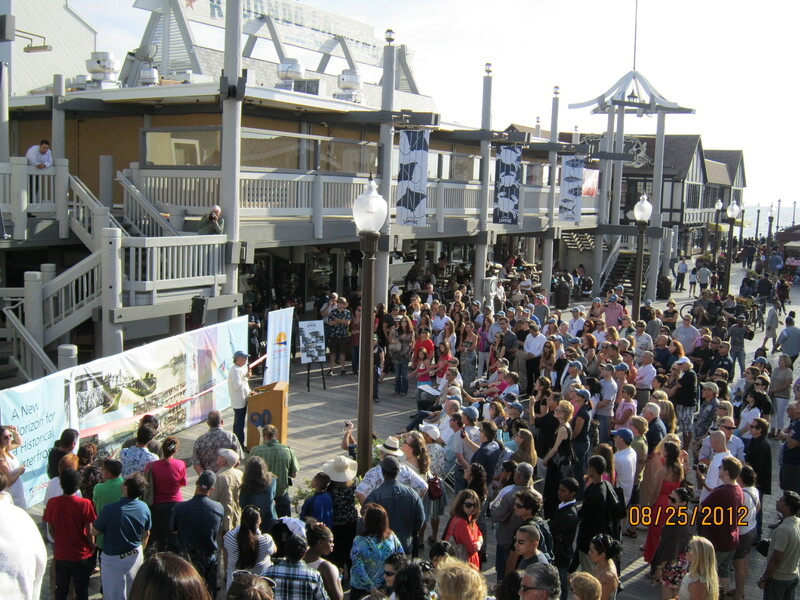 After months of construction we are about ninety five percent finished with the new Redondo Landing project. The building looks really great and there are still some finishing touches to be done in some of the stores as well as the building, but the building itself is just about finished. It took a bit longer than expected, but I’m sure that everyone wanted it to be perfect in the end. 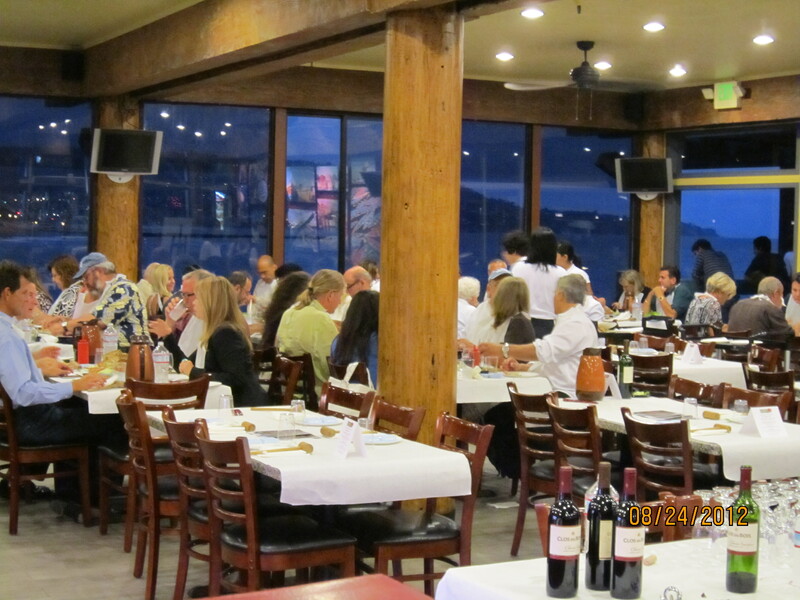 Below are some pictures of the pre grand opening dinner hosted by Robert Resnick for all of the city officials at our own Redondo Beach Crab House. 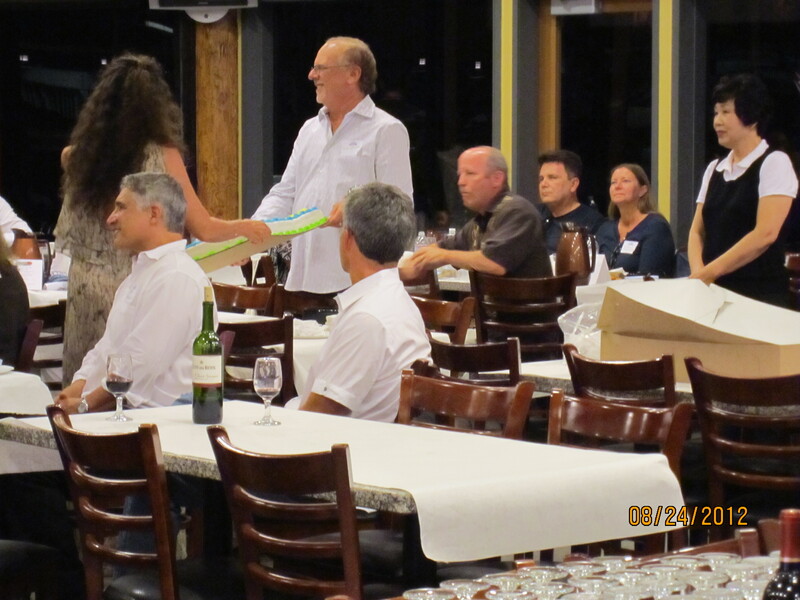 The evening included a grand pre tour of the entire building along with a custom menu we designed. The night was a great success! The next day Sunday Aug 25th, was the official date of the grand opening hosted by the mayor along with the city and the pier had a great turnout. 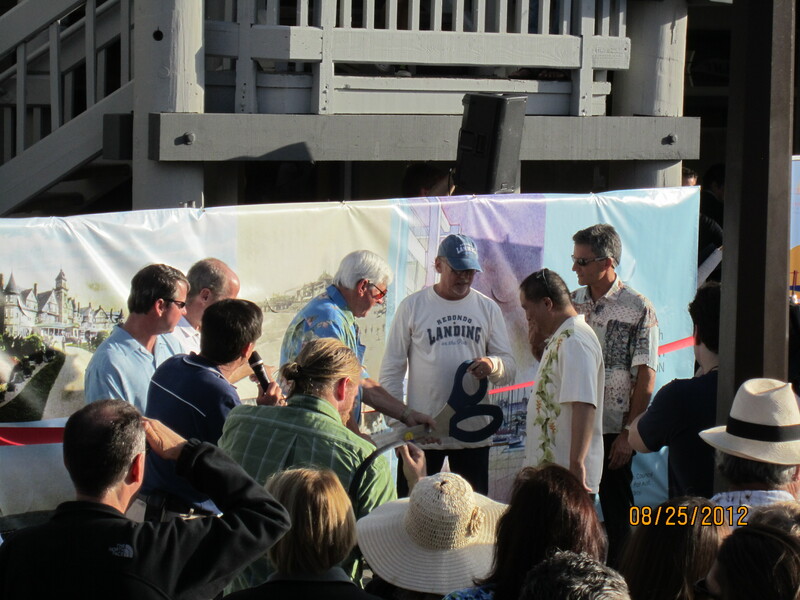 Thanks to everyone who attended the ribbon cutting for the new Redondo Landing. In being the first step toward the revitalization of the pier project, we hope that more and more folks will join in and make this pier a bigger success than ever! 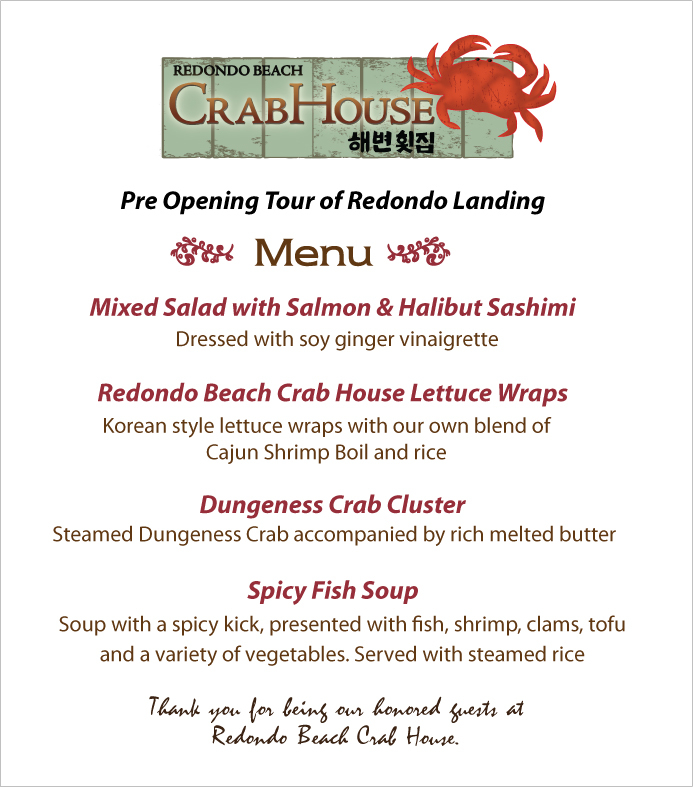 Redondo Beach Crab House is getting a makeover! Our building is getting a makeover! Our landlord and owner of our building Robert Resnick has decided to be a frontrunner in the revitalization of the Redondo Beach Pier Project. This project has been talked about and planned for years and is now finally a reality. Our building will feature the architectural style of the Old Redondo Pier and Loeff’s Hippodrome from the early 20th century. The pedestrian areas of the pier will be improved as well. The landscape will feature paver stones and construction is scheduled to complete by the summer of 2012. 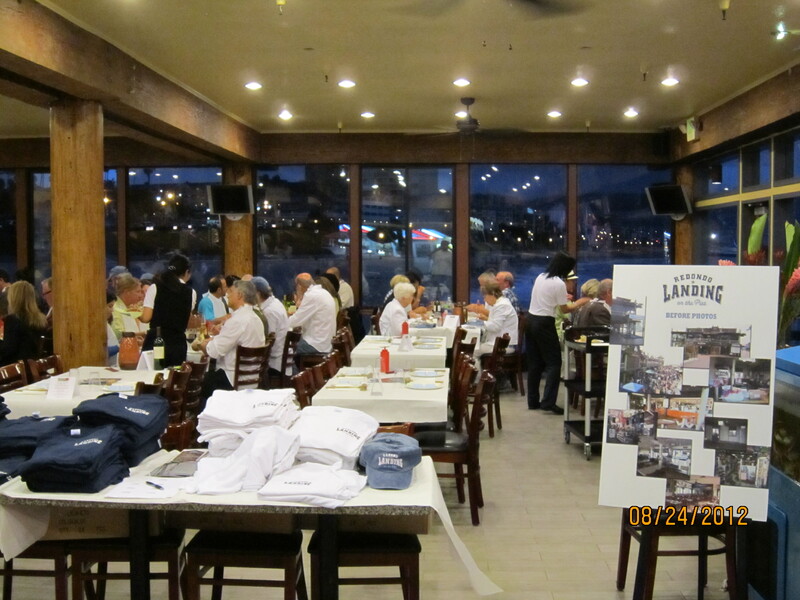 The pier along with Redonod Beach Crab House has and will stay open during construction. The photos below feature a before and after photo of how the building will look when completed. The pictures of course show the east side of the building. We are located on the west end of the building so you can’t really see us in this photo. Construction has already started and we are looking forward to completion. Our side of the building will feature more windows so that our customers can enjoy an even better view than the one now. We are very excited about this project because we will also be changing our interior as well. We have already met with our great designers and they have spent much time and effort in coming up with many wonderful ideas. We can’t wait to be finished and we hope that you enjoy our new look as much as we do. 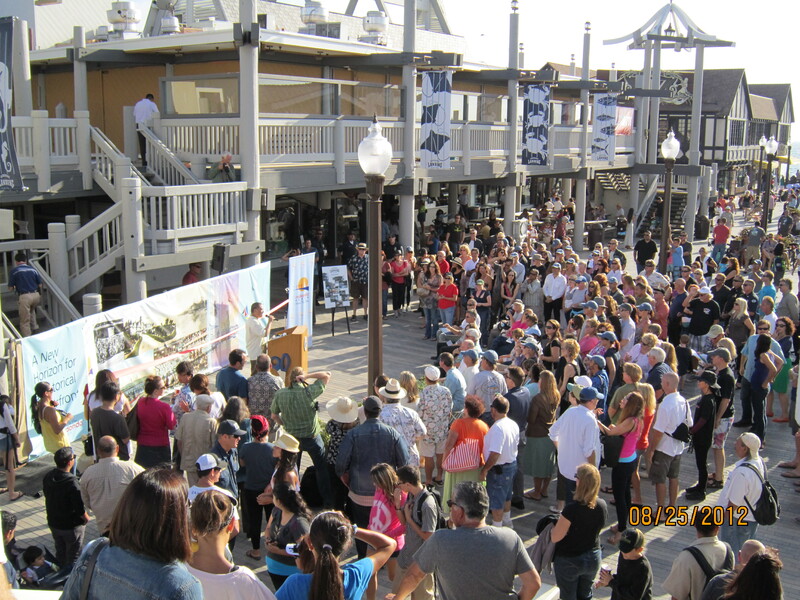 For more information, check out the website at www.redondobeachwaterfront.org. 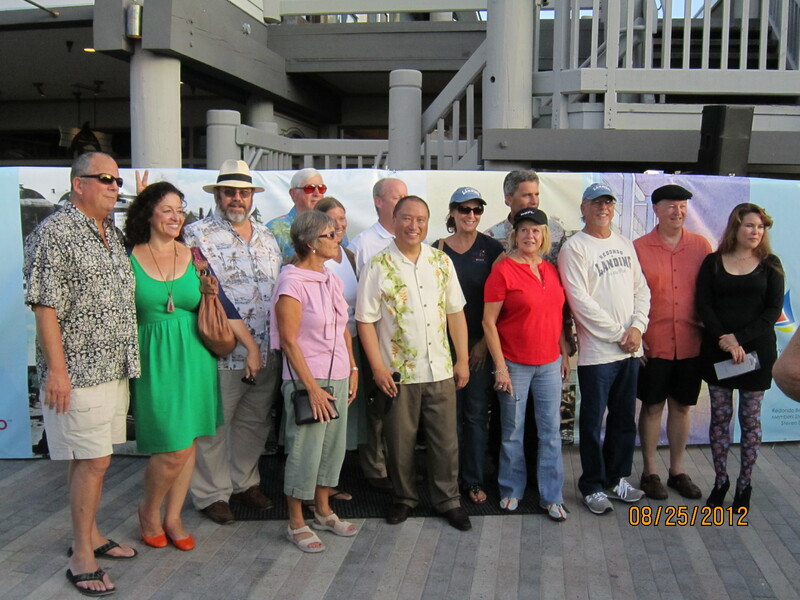 Come enjoy the Redondo Beach Pier anythime of the year. The hours here are pretty much the same and the pier never closes. If you are looking for a nice casual place to eat you can always dine with us or check out our outdoor restaurant The Four Kitchens. They’re menu items include everything from Burgers, Snacks, Mexican & Korean cuisine to Seafood. They also have a large variety of soft drinks and alcoholic beverages for your pleasure. Kincaids is also a great place to eat if you are looking for a more upscale restaurant and Pier Bakery is the best place to grab and enjoy a churro or two during your visit here! If you are into Karaoke & live bands, check out Starboard Attitude & Brixton where you’ll always find fun songs and great live bands. Don’t forget to stop by Kobe Pearl while you are visiting the pier as well. See Tommy or Ron and watch them shuck a pearl right out of an oyster that you can personally pick. If your real lucky you may even get two pearls out of one oyster. You can then have it set as a ring, earrings, necklace or any other fine jewelry. Last but not least, visit our friends Tom & Ani at The Sunshine Kite Company located right next to us where you’ll find all sorts of unique kites and fun items! If you are looking for things to do, the Pier Marina offers tours on a glass bottom semi-submarine (known as the Looking Glass) as well as whale watching on the 65′ Voyager. You can rent kayaks or pedal boats or just play video games and win prizes at the Fun Factory Arcade. You can also rent bikes, or go sailing by King Harbor. There are even romantic gondola cruises! 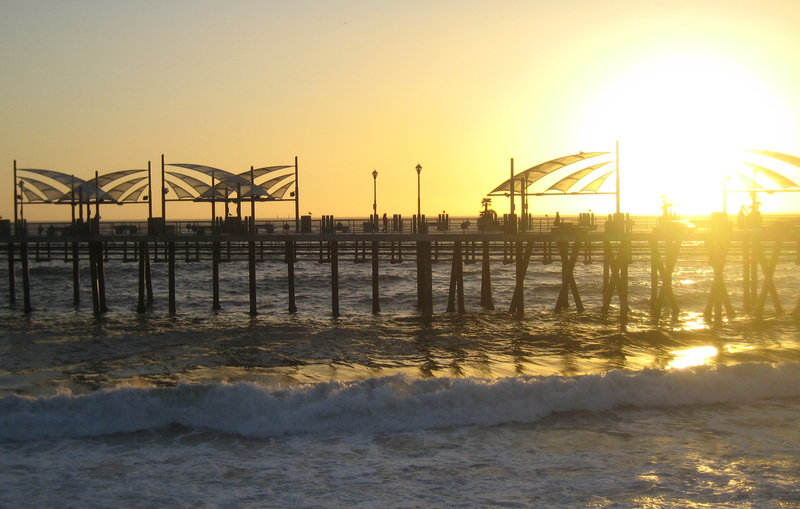 Whatever it is that you are looking for, we are sure you’ll have no trouble finding fun here at the Redondo Beach Pier. Come and bring the whole family for some fun! Thanks to Koream Journal for choosing us to host their office Christmas dinner party. For those who are not familiar with Koream Journal, it is an award-winning monthly magazine that focuses on covering the news, culture, entertainment, sports and politics as well as the people of Korean America. It helps spread awareness and entertainment to the many Asian Americans living in the U.S. Koream is also the oldest most widely circulated English language publication for the Asian American community. James Ryu is the founder and publisher and we are very proud to have James and Koream Journal as part of our community! You can check them out at www.Iamkoream.com. 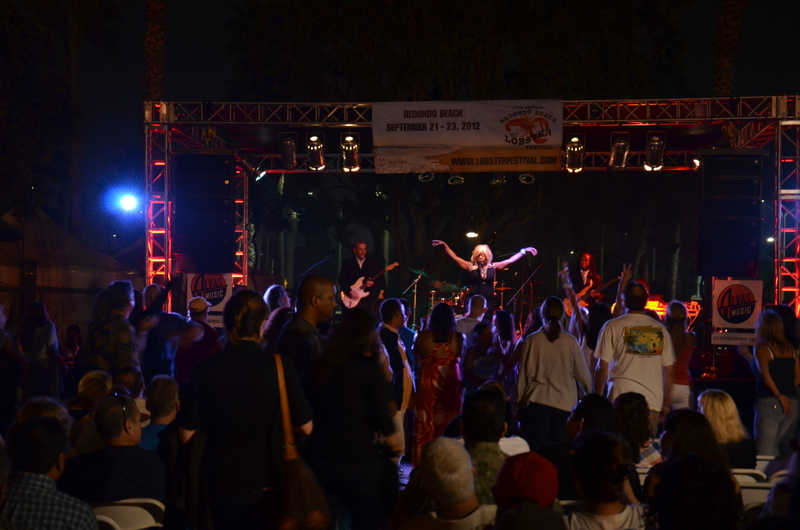 The Redondo Pier Association is hosting its annual Taste of the Pier this Oct 8 & 9, 2011. You pay for a book of ten tickets and then trade tickets for samples of food at each participating restaurant on the pier. It’s a great way to sample the menu items that each restaurant has to offer. We will have sample items of Spicy fish soup & Grilled Shrimp. Our outdoor restaurant “Four Kitchens” will be sampling our Cajun butter shrimp, Clam chowder & Hawaii Garlic Shrimp. The Cajun & Hawaii Shrimp were a big hit at the Lobster festival and they are the newest items on our menu. We are finally ready to serve the dishes here. Be sure to stop by and try some! The Lobster Festival was great! Thanks to everyone who came by and hope to see you at the restaurant soon! We had a very nice booth and awesome neighbors who do events only. Be sure to check out Big Al’s Cajun Cuisine and Thai and Chinese BBQ at other events! Big thanks to Absolute Media Solutions in Irvine for making our sign as well as our brochures on such short notice. 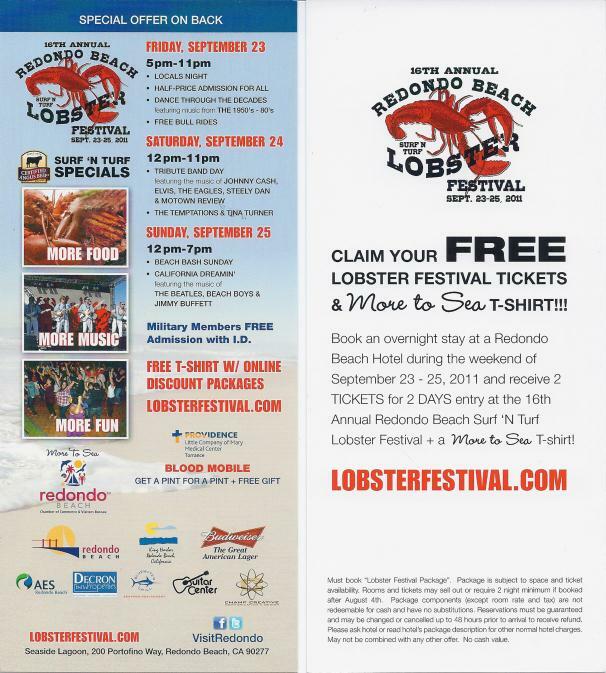 Come join us at the Redondo Beach Lobster Festival this weekend! We will be serving our Grilled Shrimp, Cajun Butter Shrimp as well as our Hawaii Style Garlic Butter Shrimp. There will be plenty of entertainment and plenty of food.